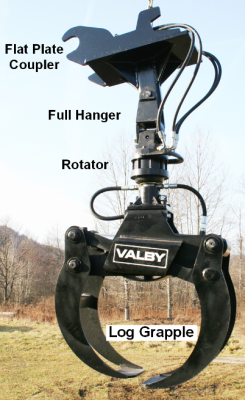 A VALBY® Grapple will turn your excavator, backhoe or telescopic loader into an Efficient Loading Machine!. 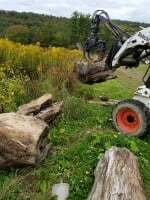 Grapples have far more dexterity than a bucket and thumb.VALBY® grapples are also available as attachments for skid steer loaders, or even mounted on a tractor 3 pt hitch. 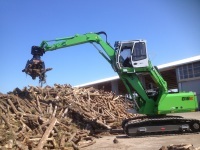 VALBY® Log Grapples are the perfect choice to replace old-style pinch grapples on log loaders. 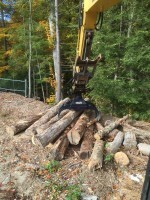 VALBY® Bypass Grapples grab logs tightly, helping you work fast but stay safe. 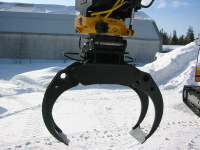 We have many grapple styles available, including Log, Universal/Stone, Sorting/Waste, Demolition and Clamshell Buckets. 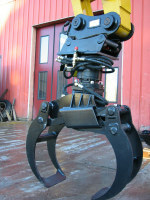 Hanging rotators hang directly from the boom or from a flat plate coupler via an "H-style" full hanger, which has two pins at 90 degree plains. 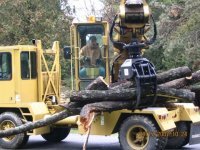 This allows the grapple/rotator system to swing in any direction, so the stress of the load is always straight down on the rotator (an "axial load.") This way, the rotator housing doesn't crack from twisting or side-load stress. If you plan to pin directly to your boom, you will either have to fabricate your own hanger, or have us create a custom full hanger that will fit your boom. 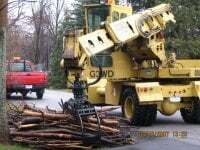 Either way, you will need to determine the measurements of your boom. Another option is to fabricate only the top hanger to fit your boom, and weld it onto our bottom hanger, aka half hanger. Our bottom hangers are stock items, sized for specific combinations of grapples and rotators, so there is no guess-work on your end. 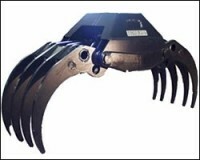 If your excavator has a Quick Attach, we can fabricate a flat plate coupler to fit. This way, you can change your grapple and bucket with ease. We would need to know the Make/Model of Quick Attach, and whether it is a "Pin-on" (manual pin) or a "Pin-grabber" (hydraulic pin) Quick Attach. 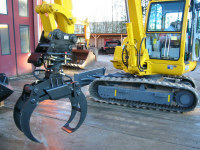 Rigid rotators must be installed on a flat plate coupler in order to extend the grapple horizontally. 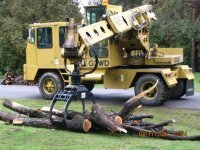 A grapple/rotator system requires two full hydraulic circuits to provide rotation and clamping functions. 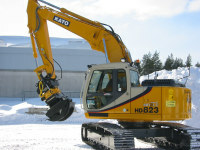 However, even if your excavator does not have two circuits, we can still provide you with a working system. You would simply need a diverter valve that allows you to split one circuit into two functions. The diverter valve installs on the side of a flat plate coupler or directly to the boom, and operates via a wire harness from the valve to the cab, with a foot-operated tap switch. 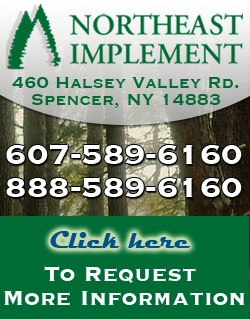 If you have any questions regarding the installation process, please call us directly at 888-589-6160. 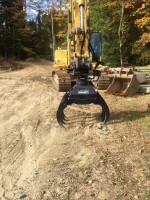 Anyone that answers the phone can help you with your grapple and rotator configuration.